After graduating from college in 1934, Julia McWilliams (who would later be known as Julia Child) found work with the Office of Strategic Services (which would later be known as the Central Intelligence Agency). Her first successful recipe was for shark repellent, to prevent underwater explosives meant for Nazi vessels from being jostled and detonated by sharks. She met Paul Child, a fellow OSS agent who was an erudite culinary expert, and married him against her father's wishes -- her dad was an ardent supporter of Richard Nixon, and Paul was a Democrat. In 1948, the Childs were jointly assigned to the U.S. Information Service in Paris, where she attended the prestigious Le Cordon Bleu culinary academy. Julia Child wasn't much of a spook by modern CIA standards, but she was promoted to administrative duties, sorting through classified documents. In the 1950s, though, she was an early and persistent critic of McCarthyism. 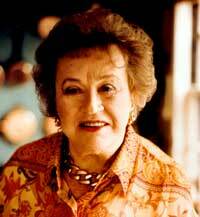 With two French chefs, Simone Beck and Louisette Bertolle, Julia Child co-wrote Mastering the Art of French Cooking. Promoting the book, she did an interview on WGBH, a public television station in Boston, and they offered her a cooking show of her own, and The French Chef went on the air in 1963.